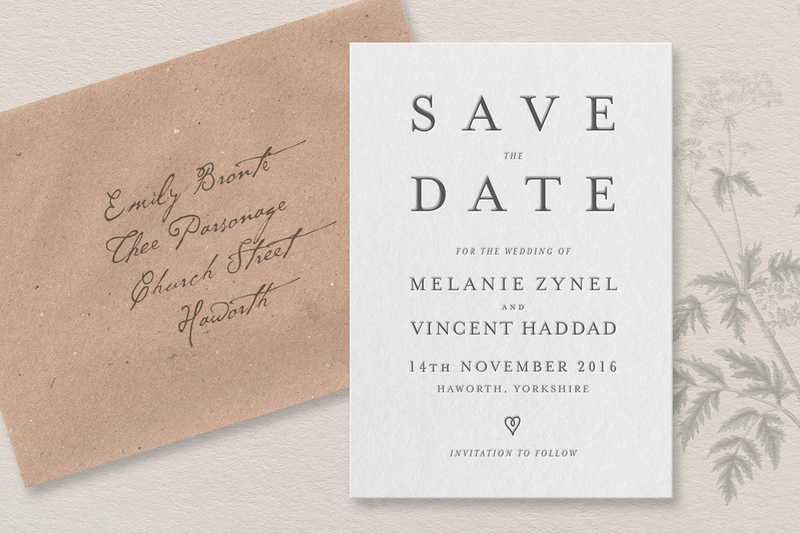 HAWORTH is inspired by timeless typography, romantic novels, the slow life, foraging and gatherings. To go behind the scenes of creating the mood board and read all about the inspiration behind Haworth take a peak on the blog. DESIGN TIP: The monogram can be exchanged for a motif from the curated collection shown here. Or exchange the leaf ornaments for a heart and ampersand from the curated monograms and ornaments shown above, for a less woodland feel. MAIN IMAGE: Invitation 127 x 178mm printed in black ink on 425g cotton. A&T: Black and gold ink on 425g cotton with monogram and bespoke luxury handmade envelopes. S&F LEEZ PRIORY: Bespoke amethyst 5x7" pocketfold, letterpress invitation in plum black ink with Leez priory Shield. Information cards digitally printed with vintage engraving of Leez priory. EMMA & MARK: Look guide for Emma & Mark's folk festival wedding. Printed letterpress in teal on 425g cotton. A5 invitation, A6 RSVP, C6 Harvest envelopes. Digitally printed information wrap on premium recycled toothy paper. Wedding favour/thank you card: A6 William Shakespeare quote. Digitally printed A5 menu. S&L: Dusty blue and gold letterpress ink on 425g 100% cotton, kraft envelopes lined by Sam and Lori.